Reno events and festivals bring big excitement to the Reno / Tahoe region. Both residents and tourists come by the thousands to enjoy everything from the Reno River Festival to Artown to Hot August Nights. At Lake Tahoe Nevada State Park, the Lake Tahoe Shakespeare Festival brings the bard to the stage at Sand Harbor. Besides being just plain fun, almost all of these events provide support to a number of worthy charities. Earth Day at Idlewild Park features displays on environmental issues, sustainable energy, recycling, and a variety of green products by over 100 local non-profits, state agencies, and businesses. There's also some pretty good entertainment at this family-friendly event. The Reno Jazz Festival is sponsored by the University of Nevada, Reno. This event has grown into one of the biggest and best jazz festivals in the country. Cinco de Mayo is our annual celebration of Mexican American and south-of-the-border Mexican culture. It is not Mexican Independence Day, but a festival commemorating the Mexican victory over the French at the Battle of Puebla in 1862. What started as a little kayak action in downtown Reno has evolved into a major spring event. Centered at the Truckee River Whitewater Park, the Reno River Festival includes adventures both in and out of the water. Bartley Ranch Park becomes the Scottish Highlands for this yearly celebration. Highland games, Irish dancing, bagpipes, and plenty of food and drink make for a day of merriment for all. The Reno Livestock Events Center hosts this rodeo extravaganza, the 4th richest PRCA event on the circuit. It gets national coverage on several sports TV networks. Teams adventure race starting and finishing in Reno, with the 178-mile course taking participants up into the Sierra and along the shores of Lake Tahoe. The original Nevada State Fair closed in 2011, but a new state fair now takes place in Carson City each June. Northern Nevada's celebration of arts and culture features events and performances throughout July. Admission to most events is free. Fourth 4th of July fireworks shows and 4th of July Independence Day celebrations will be found throughout the area, including Reno, Sparks, Lake Tahoe, Carson City and Virginia City. Downtown Reno becomes professional cyclist criterium course during the Tour de Nez. The event attracts top teams and riders around the world, yet keeps a hometown flavor with fun events for local riders. (Note: This race was canceled in 2018). Join the Bard at Sand Harbor, on the shores of Lake Tahoe, for Shakespeare and other plays during July and August. There are kid's plays and other activities in conjunction with the festival. Sit back and relax under the stars as the Lake Tahoe Music Festival brings exciting contemporary artists to venues in the North Lake Tahoe area. Enjoy the artists performing in this stunning Sierra Nevada setting. Find schedule and ticket information on their website. This is THE big annual event. For a hot summer week, Reno, Sparks, and vicinity host thousands of classic cars and tens of thousands of visitors. Multiple venues feature car-related activities, and big-name entertainment plays all over town. Our own annual PGA golf tournament draws top celebrity players and supports many Northern Nevada charities. It is played at Montreux Golf and Country Club in Reno. The Expo celebrates and promotes wild horses and burros, those unique symbols of the Wild West and wide open spaces. Downtown Reno reverberates with the sounds of thousands of Harleys when Street Vibrations takes over Virginia Street. This is the 6th largest motorcycle event in the country. It's touted as the biggest barbeque in the country and I believe it. Join over 300,000 people to taste-test the wares of 25 cooking teams, and vote to select the best. Competition is fierce but friendly. 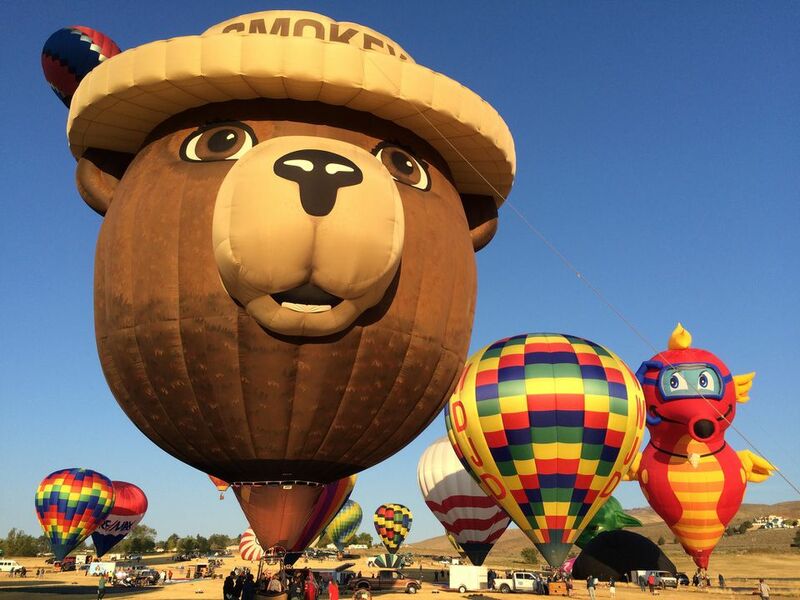 The Great Reno Balloon Race is a spectacle to behold. Each morning, over 100 hot air balloons rise in mass ascension from Rancho San Rafael Park, filling the sky with blobs of color in the dawn light. The Reno National Championship Air Races and Air Show is a whole series of activities centered around the actual air racing. The first air races were in 1964, and except for being suspended on 9-11-2001, have been held every year since. This is both an experience and an event. Take time to explore their website before you even think about trying this. Held on the Black Rock Desert playa north of Reno, near Gerlach. Nevada's own official state holiday fosters community spirit with a parade in Carson City and numerous other events to celebrate Nevada's heritage. Downtown Reno becomes Little Italy during this exuberant event. Enjoy great food from old family recipes, accompanied by music and a grape stomping contest. This family-friendly event is lots of fun.